Cathy Gillen Thacker - Romance Novelist - How can I tell which McCabe books I should read first? How can I tell which McCabe books I should read first? One of the most often asked fan questions is "Which McCabe books should I read first?". and then The McCabes: The Next Generation books--all about the sons and daughter of Sam and Kate McCabe from Texas Vows. and finally the series that is out now, McCabe Multiples. Confused? There is help! 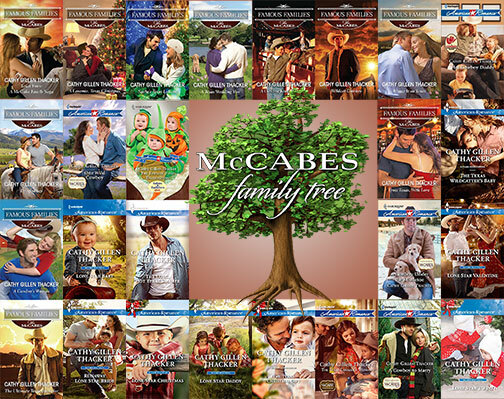 Visit my website series guide, complete with book covers, and individual story info, and a McCabe family tree, also with book covers. All that said, each book is a stand-alone read, so you can read them in any order, and refer to the family tree if you want to know more. I hope this helps! Thank you so much for your interest in my stories, and for reading!